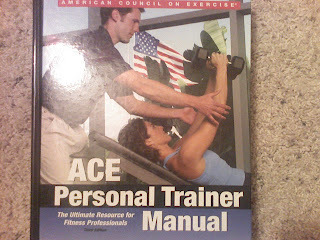 I recently decided that I wanted to be a personal trainer. So I went to the local gym and started talking to one of the trainers there. He is letting me come to his sessions with clients, I get to observe and ask questions. He is showing me all of the different equiptment, how to use each one and what muscles each one works. I am getting my certification through ACE. I just got the books, and am now learning all the human anatomy! I am stuggling with Information Overload. It is going to take me a few months to get certified, but I am very excited about it! I am loving everything about the process. I get to meet lots of people that are just as passionate about fitness as I am. I am also learning to play tennis, and am always looking for new sports to learn/play. That is awesome! If you need any help, let me know.....my major in college was sports med and I loved every minute of it. We should have a family 5k while we are all out there. I am slow right now but I think it would be a lot of fun. I love running, I am glad you guys are coming on board....now we've got to work on everyone else. p.s. have you got any of my emails the past week? I am afraid I have been sending them to the wrong address. And also, I wanted to see if maybe Morgan wanted to match my girls for the family picture. I have a little extra fabric from their dresses so let me know and I can throw something together for her. Sorry for the extra-long comment. Way to go! I can't seem to catch this bug that is going around. The running bug. I run for a week or two and then I quit, then I run for a week or two and then quit. I think you will make a great personal trainer. Good luck! When you are done with your certification move back here and I will pay you to be my personal trainer.....I think that would be soooo much fun to do. Good luck!! and anatomy is fun to learn. P.S. your kids are so freakin cute! !